We support over 50 different languages, making our self-service platform a one-stop-shop for improving caller experience. Sign up! We only need a few basic details, and it’s completely free. You’re in. 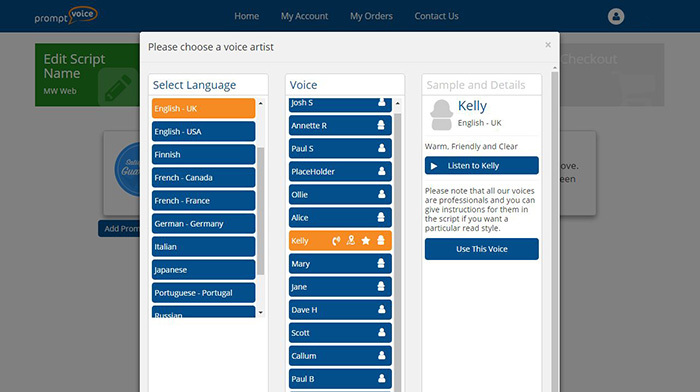 Select your language and then browse voices. You can listen to each voice to help you to decide. Click on "Use This Voice" to select the required voice for your script. Type in your script or perform a bulk upload. Now’s also the time to enter any special instructions for your voice artist. 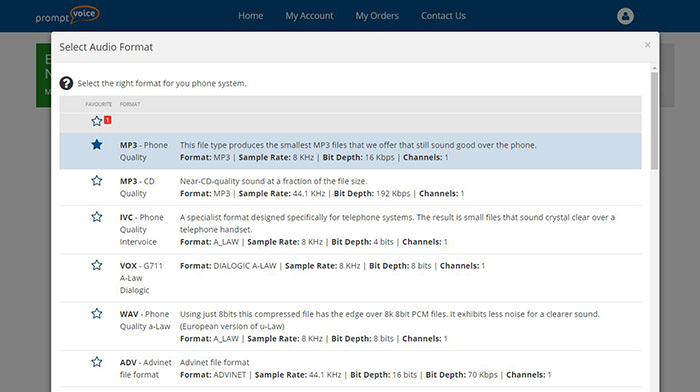 Now select your audio file format. Pay for your recordings with PromptVoice credit or via our secure checkout, using debit or credit card or Paypal. Once that’s done, you can use the dashboard to track the progress of your recordings. We'll have your prompts ready within five days and email you a link to the file. And that's it – you’ll soon be building up an easily searchable online library of recordings to use! Our business is built on great customer service, and we want to provide prompts you’ll love. If you’re not entirely happy that the recording is correct or that your instructions have been followed, let us know within 2 weeks, and we’ll re-record it for you. 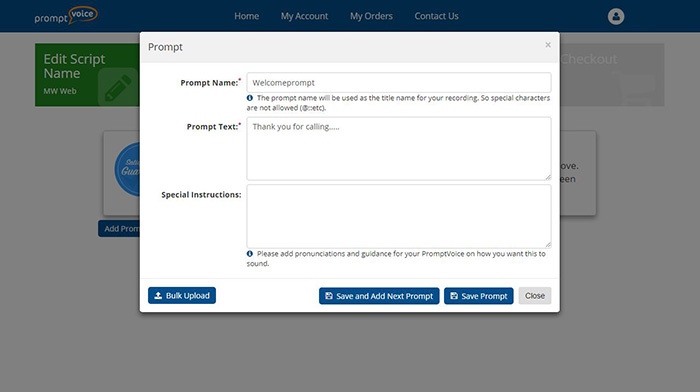 As you use PromptVoice, you’ll build up an easily searchable online library of recordings, default file formats, unusual pronunciations, and regular voice artists. Our system is simple to use, and finding what you need for your call centre or telephone system will soon be second nature.